RCBC 1 Million Rewards Raffle ~ Philippine Freebies, Promos, Contests and MORE! Make your wish come true in RCBC's 1 Million Rewards Raffle Promo. Use your card anywhere and charge a minimum of P1,500 on either straight or installment purchase. You will be entitled to one (1) raffle entry for every qualified transaction. Raffle numbers will be electronically generated. There will be three (3) raffle draws wherein 3 winners will be rewarded with 1,000,000 Rewards and 9 winners will win 100,000 Rewards that will be credited to their RCBC account. Note that you can only win once in the entire promo. Raffle prizes may not be converted to cash or transferred to another RCBC Bankard other than the account qualified for the promo. 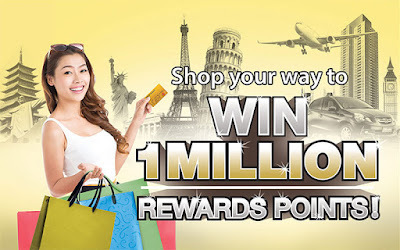 Enjoy using these points to get shopping vouchers, FREE flights for travel or other purchases - anywhere you want!